And the stillness is shattered. You heard the sound behind you. Post-election turmoil has gripped the minds of many, and I've noticed that my students--both undergraduates and graduate students--are more than a little anxious about what a Trump presidency means for their futures. This is not a poor question to be asking. Political climates affect budgets. Budgets affect jobs. Jobs affect you. So, let me weigh in with some ideas--in an attempt to provide a way forward. Let's look at some trends. my senior fisheries and wildlife students. It's an attempt to provide a big-picture, long-term view of some agencies and NGOs that provide jobs for our students at the University of Nebraska-Lincoln. Point: they've been around for a long time, and will continue to be around for a long time. Even the oft-maligned EPA was created by a Republican (Nixon) and has survived previous attacks on funding levels. The majority (even a larger majority than those who voted for Clinton in '16) of the citizens in the US is concerned about the environment, depends upon the environment, and likes to spend time outdoors on vacations. These agencies and NGO's will remain well past a Trump presidency. environmental community--it happened when both Bush gentlemen were elected. That fear was present when Reagan was elected. Not all of the representative environmental agencies are in the Department of the Interior, but the ones most susceptible to budget cuts are in that agency (Forest Service is in the USDA, for example). 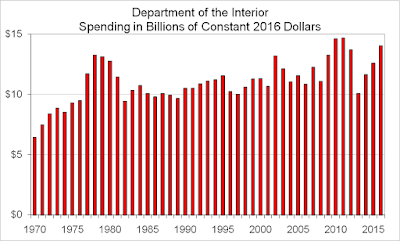 If we look at the budget trends, adjusted for inflation, we see that in the past, there are certainly more dollars for Interior during the Obama administration (in some cases almost 40% more than in the previous administration), but Interior's budget was also prone to lean-year cuts (e.g., 2012). Take-home point: yes, good chance budgets will be smaller and federal jobs may be harder to get. The work-around for current students: take advantage of any chance to get into federal employment. Pathways Program. Take a non-biologist job to get into the federal system. I know many current federal employees who tell stories of taking jobs as office assistants or maintenance workers just to get federal status. They bided their time until a position was open and their federal status gave them a leg up. Do what is needed. Be geographically flexible--yes, you may have to spend time away from your boyfriend or girlfriend or fiancé. You may have to move away from family for a few years. How badly do you want to work in the field (and this has been true even when jobs were a little more plentiful at the federal level)? for that MS or PhD? What's going to happen to research funding? One type of funding that won't change too dramatically is the funding for wildlife research based on Pittman-Robertson funds--the funds that are derived from gun sales and ammunition. These funds have been at high levels, as the figure here shows, during the Obama administration because people thought gun regulations were going to limit the types of firearms and ammunition they could own. So, ironically, every time Obama was elected and every time there was a school shooting, gun and ammunition sales would dramatically increase--and the 11% tax would come back to states for research on game species. That point is important--game species. If you are a student with dreams of doing conservation on bobolinks, consider getting a summer job working with pheasant research (funded by the PR funds). If you want to have a research career with focus on reptiles, consider a summer job on a white-tailed deer research project. Learn how to conduct research. Use the game species funds to your advantage. Come back to non-game species when opportunity provides--don't sit around waiting for a bobolink project to magically appear. You'll waste some of the most critical years of your career. And finally--what about those students who are looking at jobs funded by state government? Academic positions or jobs in state wildlife agencies? Both types of jobs are supported by state-level budgets. Although a Trump presidency has potential to affect the economy, there are also longer-term economic trends that are coinciding with the new Trump administration. Students should be looking at those as they plan where they might work and target their job applications. and you'll see that the agricultural states in the Midwest are slumping as ag commodities struggle. Yup--there is a connection to how many of these states voted in the election as well. But, to the point of students looking for jobs--my suggestion is to not hang all of your hopes on states that are struggling. Look at states where budgets seem to be doing better and don't leave those off your job searches. Sure, there will continue to be jobs in states like Nebraska, but if I were looking for state-supported jobs, I'd be looking at the Blue States in this figure...states with increasing GDP. The point--pay attention to budgets. People aren't just waiting to hire you because you are an excellent prospect. They have to have funds to hire you. Academic work-around: look at smaller state schools and private colleges. This was my career track during the late 90's when academic positions were also in short supply. I worked for three years at a private college--it gave me teaching experience and the start to a research career, and I worked what was left of my nights to get manuscripts published from my postdoc and PhD. After three years, I was more competitive for a large-University position. Do what it takes. Students will always go to smaller schools, and there will always be positions there. Smaller salary. Yup--my family was $2500 away from food stamp level the first year of my first academic job. I did what I could to start my career, and we made it. Another work-around: look to NGOs. Non-governmental sources of employment. Audubon, TNC, zoos, Pheasants Forever, Rocky Mountain Bird Observatory--and other similar folks. 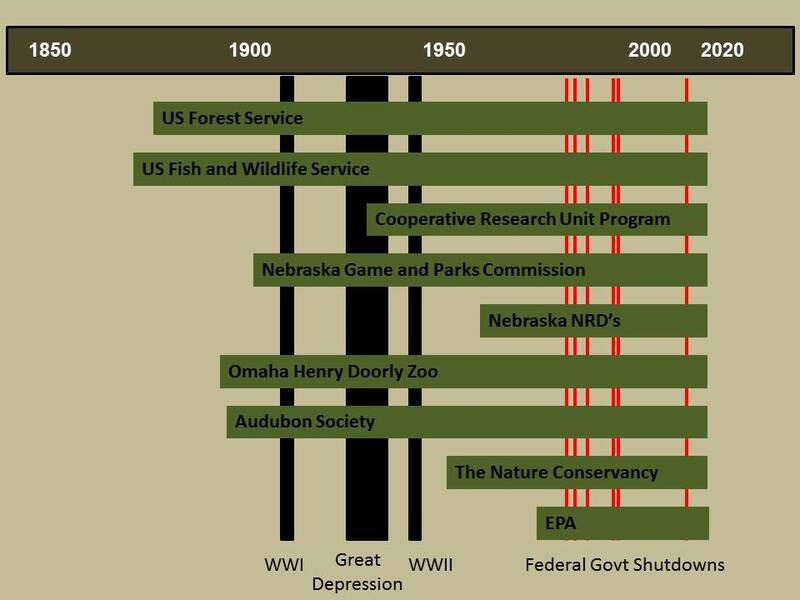 Especially in states where economy is going well, these groups may have funding for positions in conservation and research that are not dependent (as least as much) on federal dollars. Their members or supporters provide funds--these donations are dependent on the economy (people donate when they have extra money to donate), so keep your eye on the economy as you look at these organizations. Last work-around: look to environmental or ecological consulting firms. These jobs are sky-rocketing, to be honest. In times of state and federal budget shortages, agencies may have money to do a project but no money to hire the workers to do it. The solution is to contract the wetland restoration or forest management planning process to an environmental consulting firm. Start looking at job ads with those firms and see what they require of their employees. Plan your courses and training appropriately, or spend a summer working for them rather than working on a graduate student research project (as much as that pains me to write it...). It's your future--society needs you more than ever. Our environment needs you more than ever! Don't panic at the change occurring, politically. I'm not addressing any human rights concerns of a Trump presidency here--my goal is to specifically work with students on their career options. I hope these thoughts are helpful. If you have other ideas, feel free to post a comment!